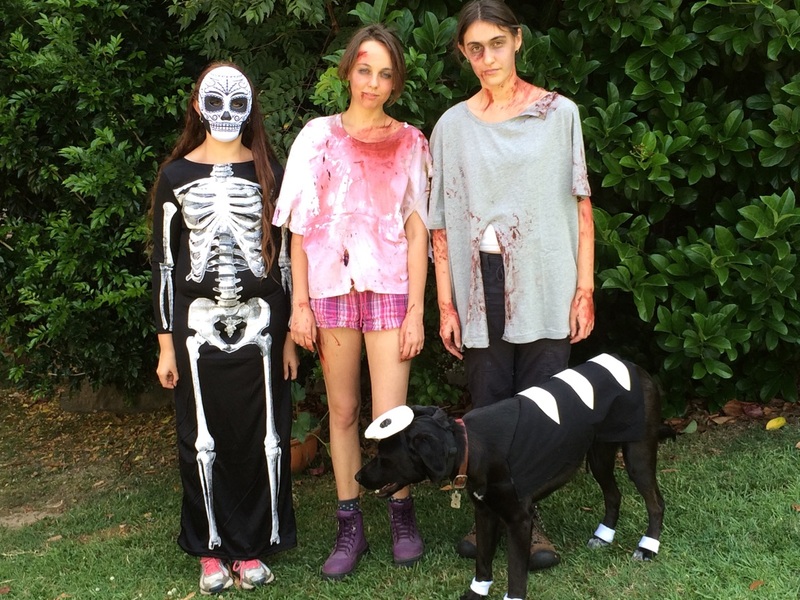 Halloween in Australia isn’t very big, and my family have never really celebrated it. But this year in our town a group who support people with disabilities put on a Zombie Walk. It was a fun afternoon at the race course with games, zombie movies and local bands, and everyone (around 600 people) went on a 6km walk through town to promote mental health awareness. I went along with my Person, Little Sister, and my Person’s friend who we’ll call Geek-Friend. She is very nice and is very similar to my Person in as much as she suffers severe social anxiety, so she understands my Person’s situation very well. Geek-Friend, if you couldn’t guess, loves all sorts of geeky things and she comes over every week to watch shows like Star Wars and Futurama. 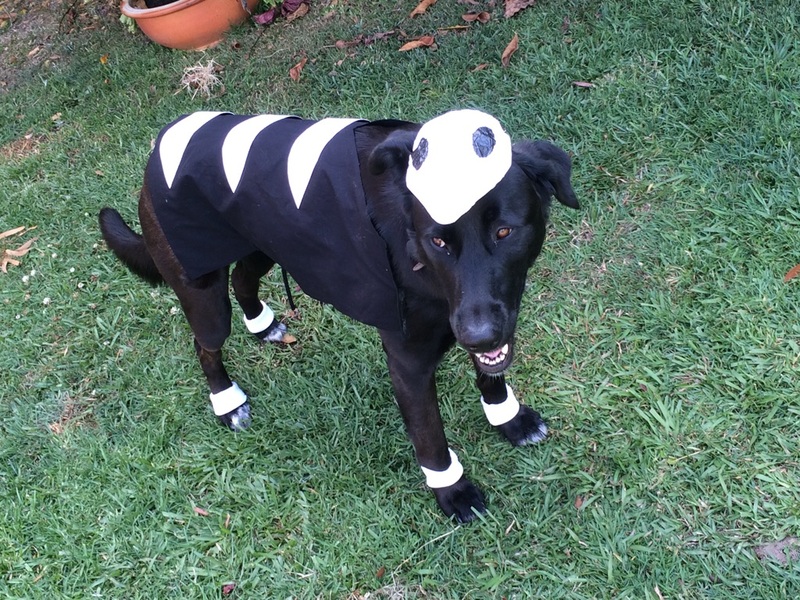 My Person dressed me up as a Houndour, which is a type of Pokemon. 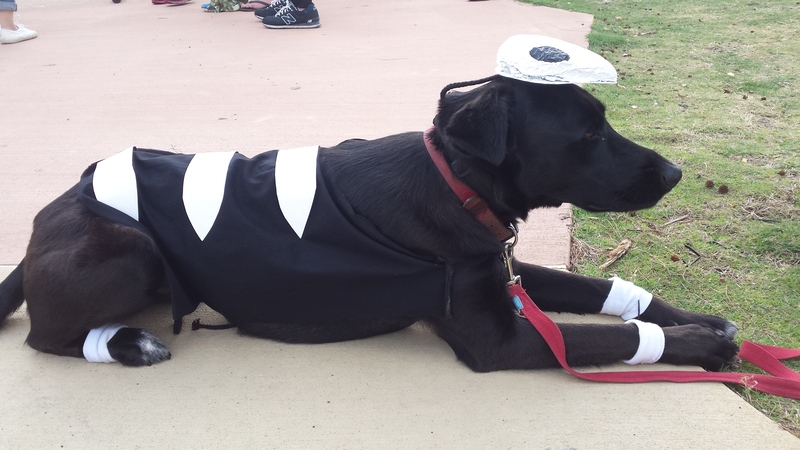 There were a few people who got my costume, but most people just thought I was a skeleton dog which was fine. The people in charge of the event knew my Person and Little Sister from youth and disability groups, so they were very happy to see me accompanying my Person. 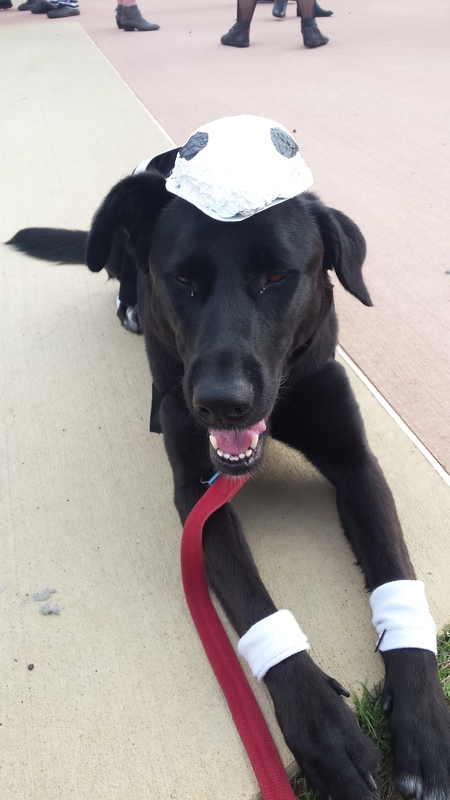 Especially since I am primarily a psychiatric service dog and it was an event promoting mental health awareness. However the security guards that worked at the race course who were there to make sure everyone was behaving themselves didn’t like having me there. We were expecting to have some access issues so my Person had brought along my coat and ID card. The first time my Person showed the security guard my ID it was clear the he was sceptical, but didn’t say anything and just walked off. When we came back from the Zombie Walk through town we stopped to talk to another friend and another security guard came over and asked to see the ID we had shown the other guy. We were very grateful when the friend we were talking to stepped in for us and reassured the guard that service dogs are allowed everywhere with their handler and that I was not a problem. The guard insisted that I take off my costume and put on my coat to “save all the confusion” the security guards were the only ones confused by this, no one else cared at all. Apart from the anxiety and stress my Person had, caused by having to talk to big, scary security guards it was a very fun afternoon. I got lots of cuddles and pats, and everyone took photos of me. I didn’t even mind wearing my costume. Hope everyone had a safe Halloween and got lots of yummy treats.